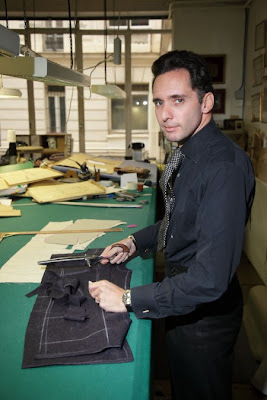 Legendary tailors Cifonelli have an exceptional story to tell. Unlike most of their peers around the world, the house was founded in 1880 yet remains entirely in the hands of its fourth generation, steering the company through its transformation from confidential bespoke workshop to luxury brand. The family has accomplished the feat of passing on its savoir-faire to each generation without giving in to luxury conglomerates. It has resisted the temptation to sell its famous name through mass distribution, unlike some British tailors. Cifonelli has become one of the only bespoke houses in the world where you will always be greeted by a family member. Say hello to Lorenzo and Massimo, the fourth generation. The house was founded by Giuseppe Cifonelli, who first set up his workshop in Rome. His son, Arturo, expanded the business and became the soul of the style and the artistry of Cifonelli. 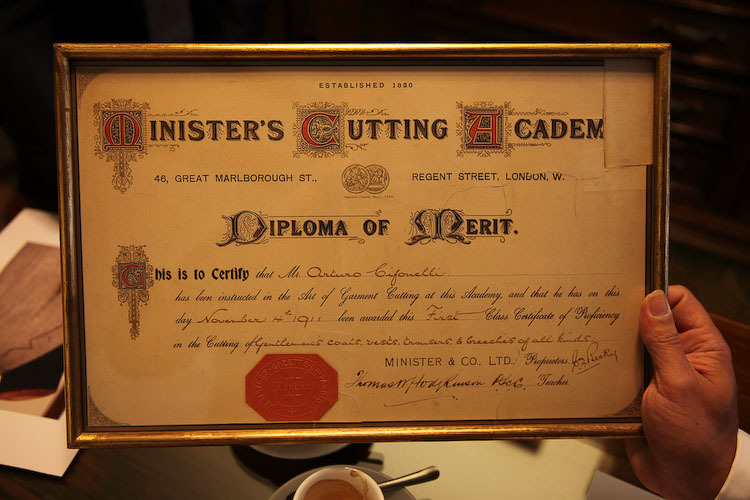 Arturo was sent by his father to London to be trained in the art of cutting at the very proper Minister’s Cutting Academy. His diploma is dearly held in the shop Rue Marbeuf (pictured below). The Cifonelli style, a blend of British strictness and Italian lines mixed with something definitively French, was shaped and developed by Arturo in his first Paris workshop. One opened in 1926 on Rue Courcelles and the second, still standing at the center of Paris’s golden triangle, was inaugurated in 1936 at 31 Rue Marbeuf. When Arturo died in 1972, his son Adriano took over and carried on developing his father’s work until the beginning of this century. The Cifonelli reputation slowly started to spread outside the small, stylish circle of men like Paul Meurisse, Lino Ventura, Marcello Mastroianni and, most importantly, François Mitterrand (whose Cifonelli collection was recently auctioned at Druot). Between 1992 and 2007, the Cifonellis also made all the bespoke suits of Hermes (1992-2007). 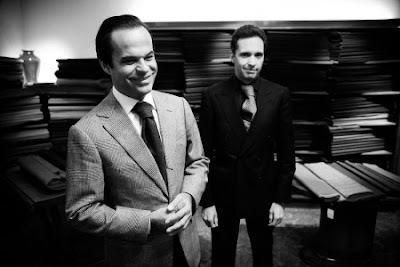 In the early nineties, Lorenzo (Adriano’s son) and Massimo (Lorenzo’s cousin) truly entered the business, after spending their youth around bundles of fabric, paper patterns embossed with luxury stamps, watching workers hand stitch utterly perfect Milanese buttonholes. In 2003, the two cousins officially took control of the bespoke workshop rue Marbeuf. In 2007, they developed a made-to-measure and ready-to-wear storefront in line with the high tradition that they set up right below the original workshop. At that time, two important events proved the Cifonelli commitment to perpetuating their sartorial expertise, as their heritage was put under threat by other labels and by an aging workforce. The first of these occurred in 2000 when Cifonelli acquired Claude Rousseau’s workshop (and its workers). The second was the 2008 purchase of another famous Parisian tailor’s shop and staff, Gabriel Gonzalez. If you are familiar with the small world of French bespoke houses, you will understand the importance of these acquisitions, that successfully brought back together the legendary Camps de Luca team, 30 years later after its separation (when Mr Camps was at the helm). Back then, the team had Smalto, Rousseau and Gonzalez on board. Talk about a dream team! Lorenzo credits Claude Rousseau, who has since retired, for teaching him the extreme art of detail and an obsessive care for finish. 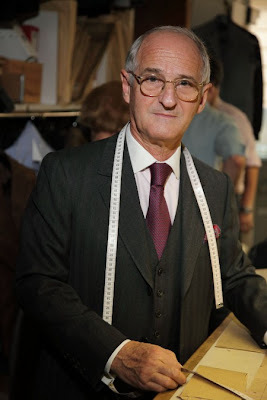 Gabriel Gonzalez (below) still works on Rue Marbeuf, as passionate as ever about tailoring despite being 72 years old. Next: An interview with Lorenzo Cifonelli, about the Cifonelli style (and its famous shoulder), the renewed clientele, and development projects for Japan and the US. You can follow the discussion on The story of Cifonelli by entering your email address in the box below. You will then receive an email every time a new comment is added. These will also contain a link to a page where you can stop the alerts, and remove all of your related data from the site. Remarkable story. Thanks for this exceptional summary of the Cifonelli’s business. In your future article, could you inquire of their flexibility to make soft shouldered garments, the bespoke process including the number of fittings etc and, if it’s not too intrusive, the general price range? Please extend a thanks to Parisian Gentleman, great interview with lots of insight. I didn’t know they use to make the bespoke suits for Hermes. I look forward to the next interview, specifically the information about US projects.